is subtitled “A German Children’s Story.” But this dark fable is really Michael Haneke’s A Series Of Unfortunate Events. An invisible tripwire lashed between two trees sends a doctor crashing off his horse – and that mysterious ‘accident’ is just the start of the strange and increasingly terrible crimes in a quiet German village on the brink of World War One. Pets are killed, cabbages are beheaded, women are humiliated. But again and again, it’s the kids who get it bad. lenser Christian Berger shot the movie in colour, then drained it away and digitally sharpened the image, leaving behind stunning monochrome cinematography that picks out facial expressions with alarming immediacy. So it’s hard to fault this superior movie from Europe’s most revered modern filmmaker. Then again, superior is the word. 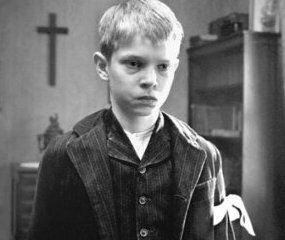 The only thing that makes The White Ribbon gleam a little coldly is the fact that, not unlike another recent “masterpiece” There Will Be Blood, you can’t shake the feeling that’s exactly what its maker thinks it is. No commentary, no interview, no nothing on the DVD. The wait for a Haneke blooper-reel continues.